Hey guys, this is my first post here. I have been working on installing dolphin for sometime now so that I can play the ssbm netplay on anther's ladder. 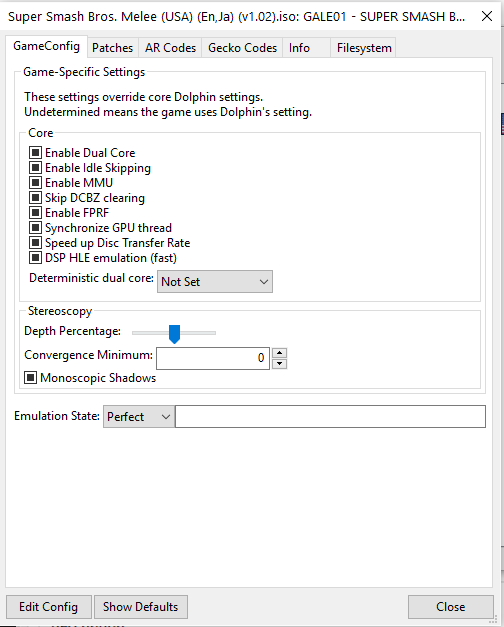 So, after doing some research I have found threads on how to optimize your dolphin configurations for a gaming laptop, specifically using this guide on laptop optimization. I feel as though I have followed the guide successfully, particularly with everything but the cpu optimization which describe in just a second. Firstly I wanted to describe the problem during gameplay: While playing super smash bros melee, it will be running at 60 fps and then all of a sudden there will be a stutter and drop down to 40-50 fps for about a second and then pick back up to 60 fps. It almost seemed like an audio issue since the audio would stutter as well, but when turning audio off the problem seems to persist. I am not positive that this would have rid of the problem even if it was audio, and suspect that the problem inlays in cpu/gpu configuration. So, that's what brings me here! Part of my problem seems to be that the guide mentioned earlier is a tad outdated. For instance, a section of the guide is based on cpu optimization through the use of ThrottleStop, however ThrottleStop 5.0 configuration is used, and ThrottleStop 6.0 seems to be the latest version. TS6.0 seems to have a number of new settings and options, so I don't want to screw anything up on my pc. I was hoping someone more knowledge with this program configuration could throw me some recommendations or knowledge my way. Here is a picture of the primary difference in gui between the two versions. Pictured on the left side is the thread's TS5.0 settings, and on the right side is my TS6.0 settings. EDIT: As user Helios noted, these temps are really high. 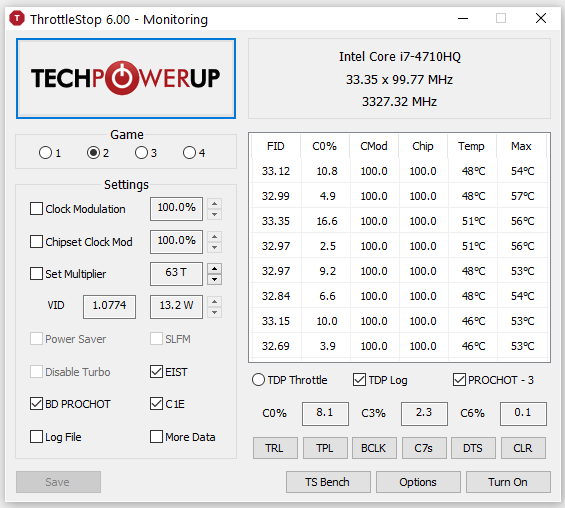 I had actually just moved my pc sitting from sitting on the bed and blocking the fan, so in a comment below I posted an updated version the ThrottleStop 6.0 gui for my laptop. To provide some more in depth information on what my emulator settings are (Dolphin 4.0-7840), I made a small imgur album showing "Graphics" settings, which may be viewed here. I didn't want to post them directly into the thread as I feel there are already enough pictures embedded as is. Finally, I have a picture of my super smash bros melee (v1.02) iso - Properties -> Game Config settings, just in case that could provide any useful information. I know this is an in depth post, but I wanted to provide as much information as possible to hopefully make any problems easier to assess. Thanks for taking the time to read this and help me! Judging by your max temps you're getting that lag because you're throttling. What bothers me though is why on earth Melee is pushing your PC that hard to 90c. That game doesn't push your system very hard at all. I've played more intensive games on much crappier systems with lesser cooling and it never gets nearly that hot. Poking around notebookcheck.net for your laptop, they were only able to get that system that hot and choke by running literal benchmarks. Crysis 3 ran cooler. Is your heatsink and fan functioning properly? Woops. That was actually a bad picture, I had not even noticed those temps! I had just moved my laptop from sitting on my bed where it was blocking the fan so I suspect that may have been the culprit. Here is an updated picture of what it looks like, I haven't enabled the settings yet because I am not sure which settings to put and don't want to do anything wrong. Also a nice thing about this laptop is that it has an alternate fan that you can turn on and off for when your gaming. I did a little more tinkering and research, but still am confused about a few things. First of all the multiplier. It seems to start out at "63T", but if I go down it will go to 35T-26T, 25-8. After I go down, I am no longer able to go back up past 35T to the original setting displayed of 63T, making it so I don't really want to save the settings on a profile of anything other than 63T. I am confused as to what the "T" stands for. Running with the settings "on" at a multiple of 63T also seemed to actually make the game run more choppy. Perhaps lowering the settings will make it run better? Its a default value, its better to manually set it yourself. What I recommend, based on how I've used it, is raising it to the max, and then lowering it by one. This will make the CPU run in turbo mode for 2 cores, which is ideal for dolphin. An alternative is using the Intel extreme Tuning Utility to manipulate clock speeds. I see, got ya. So, since my max is 35T, I should run it at 34T? Is there an easy way to tell from the data that it is indeed running turbo mode on 2 cores?